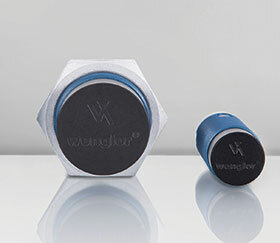 With switching distances of up to 50 mm and magnetic field resistance of 200 mT, Wenglor’s inductive sensors with correction factor 1 come in a total of eight new welding-field resistant models, with four housing designs providing impressive performance for the detection of ferrous and nonferrous metals. Applications are in the steel and automotive industries. Inductive sensors with correction factor 1 detect ferrous metals as well as nonferrous metals such as copper, cobalt, nickel and tin. The sensor always has the same switching distance, even for different metals. In combination with extended switching distances of up to 50 mm, the sensors can be used to implement a great variety of applications. The Teflon coating increases availability, especially when used in welding equipment where deposits resulting from welding splatter often have a negative effect on sensor performance. The extended temperature range of -40 to 80°C also permits use in cold and very hot environments. This new inductive generation is also resistant to DC and AC electromagnetic fields with strengths of up to 200 mT. Where conventional sensors are used, these magnetic fields often result in malfunctions and erroneous switching. This is not possible with Wenglor’s devices. In combination with large switching distances of 4 to 50 mm, high frequencies of 1500 to 4200 Hz result in impressive performance and permit use in high speed applications. In addition, all four housing designs (M12, M18, M30 and 40 x 40 mm) are available in flush and non-flush mounting variants. The switching status LED is additionally equipped with an error indicator which is activated in the event of a short circuit or excessive temperature. These sensors are suitable for all industry sectors where different types of metal need to be reliably detected. In the steel industry they can be used in the production of castings and in the automotive industry (auto-body fabrication, pressing plants and chassis components).